A new update for AggFlow DM has been released with features to help users migrate from the USB Security key version of AggFlow to AggFlow DM. Soon the old version will be discontinued and users are encouraged to download their free DM upgrade. With this latest release all AggFlow users will finally be able to use the same program and have the same equipment without any compatibility issues. Users can either take advantage of DM’s control panel features, or they can continue to use the program as before (with individual files and worksheets). Ability for design users to Work Offline with USB key from the login panel to avoid blocked or unreliable internet concerns. (Disables the internet enabled features in AggFlow DM such as Online Collaboration/Sharing and Secure Backup to the AggFlow Cloud). Drag and drop your computer saved files onto the AggFlow DM control panel for instant access and sharing. Existing USB program users can update to the new DM program at no charge and start using the AggFlow DM program immediately to work with their simulations with their current license. 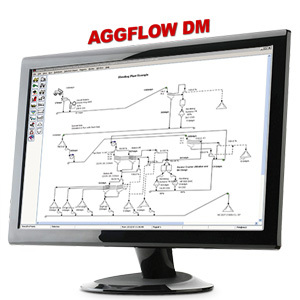 Use this link to download and install AggFlow DM.